Prashant Garhwal M.S. (Orthopaedics), Junior Specialist, Department of Orthopaedics, Government S K Hospital, Sikar, Rajasthan, India. Background: The incidence of bone fracture is impacted by many factors including age and gender. Every third child is expected to sustain a fracture before age 17. Hence; we assessed the prevalence of fractures among children of known population. Methods: A total of 100 patients who reported with bone fracture were included in the present study. Complete demographic details of all the patients were obtained. Detailed information in relation to the pattern and type of injury was also obtained. All the results were recorded in Microsoft excel sheet and were analyzed. Results: There were 63 males and 37 females. Incidence of fractures was significantly higher in males in comparison to females. 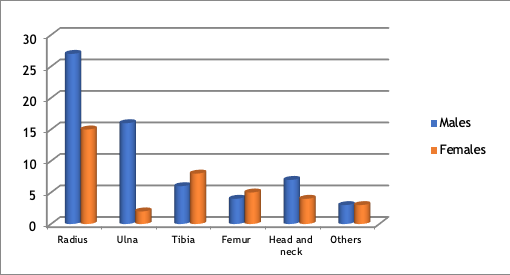 Radius was the most common bone to be fractures, found to be present in 27 males and 15 females. Conclusion: Fractures among pediatric population are significantly more common in males, with radius being the most common bone to be fractures. 1. Hammig B, Weatherley J. Gender and geographic differences in intentional and unintentional injury mortality among children in Illinois, 1988–1998. Inj Control Saf Promot. 2003;10(4):247–50. 2. Raustorp A, Ludvigsson J. Secular trends of pedometer-determined physical activity in Swedish school children. Acta Paediatr. 2007;96((12)):1824–8. 3. Petersen S, Brulin C, Bergstrom E. Increasing prevalence of overweight in young schoolchildren in Umea, Sweden, from 1986 to 2001. Acta Paediatr. 2003;92((7)):848–53. 4. Lyons RA, Sellstrom E, Delahunty AM, Loeb M, Varilo Susanna. Incidence and cause of fractures in European districts. Arch Dis Child. 2000;82:452–5. 5. Dougherty G, Pless B, Wilkins R. Social class and the occurrence of traffic injuries and deaths in Urban Children. Can J Public Health. 1990;81:204–9. 6. Vestergaard P, Krogh K, Rejnmark L, Mosekilde L. Fracture rates and risk factors for fractures in patients with spinal cord injury. Spinal Cord. 1998;36:790–796. 7. Faelker T, Pickett W, Brison RJ. Socioeconomic differences in childhood injury: a population based epidemiologic study in Ontario, Canada. Inj Prev. 2000;6:203–8. 8. Faulkner RA, Davison KS, Bailey DA, Mirwald RL, Baxter-Jones AD. Size-corrected BMD decreases during peak linear growth: implications for fracture incidence during adolescence. J Bone Miner Res. 2006;21((12)):1864–70. 9. Randsborg PH1, Gulbrandsen P, Saltytė Benth J, Sivertsen EA, Hammer OL, Fuglesang HF, Arøen A. Fractures in children: epidemiology and activity-specific fracture rates. J Bone Joint Surg Am. 2013 Apr 3;95(7):e42. doi: 10.2106/JBJS.L.00369. 10. Dosa NP1, Eckrich M, Katz DA, Turk M, Liptak GS. Incidence, prevalence, and characteristics of fractures in children, adolescents, and adults with spina bifida. J Spinal Cord Med. 2007;30 Suppl 1:S5-9.